My thoughts on this final book (reluctant disappointment) are vastly different from my thoughts of the series as a whole (happy feelings). The series is such a unique blend of genres and ideas, with some of the most memorable characters you’ll ever come across. No Good Dragon Goes Unpunished (Book #3) is one of my favorite books I’ve ever read. All that said, although I loved where the story ended, I had quite a few issues with how it got there and can’t help but feel let down by the overall execution of the last two novels of this series. My #1 Issue: pacing. Rachel Aaron is also known for her super insightful 10000 words a day writing technique (one I’ve tried and it really makes a difference!). Unfortunate, I think all of that unbridled word vomit inevitably led to two final books that were unnecessarily drawn out, wordy, and dialogue-driven than necessary. At least 90% of Last Dragon Standing was strictly dialogue – rehashing ideas and other endless explanations and discussions. The 10% of actual plot advancement was amazing 5-star quality writing, it just took FOREVER to get there. I sincerely think the series could’ve turned out amazing had books 4 and 5 been condensed into a single novel. I did not pick up anything new in book 5 that wasn’t explained 10 different ways throughout book 4, and all of that endless dialogue effectively killed any momentum it had going for it coming into the finale. I maintain that a more concise flow would’ve made for an absolutely KILLER conclusion to this series. Overall, it felt very… self indulgent seems to harsh a phrase, but it definitely looks to me as though the story could’ve benefited from an more impartial outside perspective (such as a publishing house) by requiring a more intensive edit. That’s just my personal opinion on the matter based in part on comparing these last two books to her other trad-pub titles (which had perfect pacing). Whatever the cause, the end result felt an opportunity wasted. But is the series still worth reading? That’s an easy: absolutely! 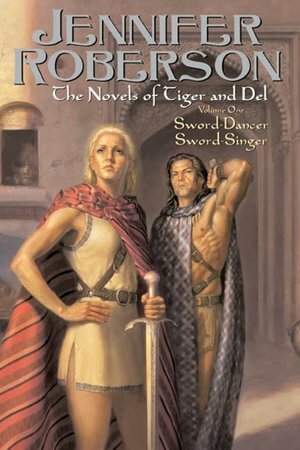 Rachel Aaron (who also writes as Rachel Bach) is easily one of my top ten favorite authors – I’ve read everything she’s published so far and have been blown away with every book (check out her Eli Monpress fantasy series and Paradox scifi series if you have a chance – you won’t be disappointed!). Then along came the Heartstrikers series – an urban fantasy about a clan of shapeshifting dragons and one who doesn’t quite fit in – and I was beside myself with excitement! The coolest thing about Heartstrikers is that it’s a true hybrid of all my favorite genres. 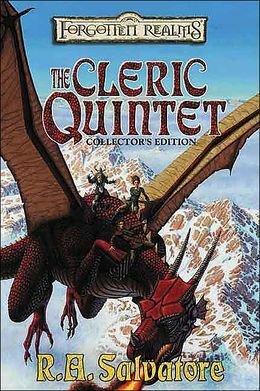 The story and presentation is very urban fantasy, but the dragons and other magical elements give it a low-fantasy feel. Also, even though it’s an adult series, it has that same accessibility and fun factor of a young adult novel. Regardless of how you classify it, the most important thing is that it’s a dang good series! The books have so many interesting dynamics! Especially surrounding the characters. Starting the series, I thought they were all going to be pretty surface level. Fun to read about, but not much depth. Boy, was I wrong! Each book takes you deeper into specific characters and they just get more and more fascinating as time goes on. After finishing book 3, I’m agonizing that it’ll be at least 8 months before I can unravel even more mysteries about these great characters. I also love the relationship between the two main characters, Julius and Marci. They are enamored with one another, but too uncertain and insecure to act on those feelings. It’s a dynamic I have never seen work well before, but Aaron found a way to make it charming rather than insufferable. Last but not least, my favorite element of the books are the dragons. They’re every bit as powerful, greedy, and cruel as they are supposed to be, which is why Julius (a nice dragon) has so many problems fitting in. The dragons have strict hierarchy, lots of interfamily dynamics, and plenty of cultural backstory to make the society feel rich and well-rounded. For this reason, the world building gets top points in my book for creativity. Overall, heartstrikers (particularly book 3) was one of my favorites of the year, and I highly recommend them to anyone wanting a fun series to read! The Overview: Eli Monpress is clever, he’s determined, and he’s in way over his head. First rule of thievery: don’t be a hero. When Eli broke the rules and saved the Council Kingdoms, he thought he knew the price, but resuming his place as the Shepherdess’s favorite isn’t as simple as bowing his head. Now that she has her darling back, Benehime is setting in motion a plan that could destroy everything she was created to protect, and even Eli’s charm might not be enough to stop her. But Eli Monpress always has a plan, and with disaster rapidly approaching, he’s pulling in every favor he can think of to make it work, including the grudging help of the Spirit Court’s new Rector, Miranda Lyonette. But with the world in panic, the demon stirring, and the Lord of Storms back on the hunt, it’s going to take more than luck and charm to pull Eli through this time. He’s going to have to break a few more rules and work with some old enemies if he’s going to survive. 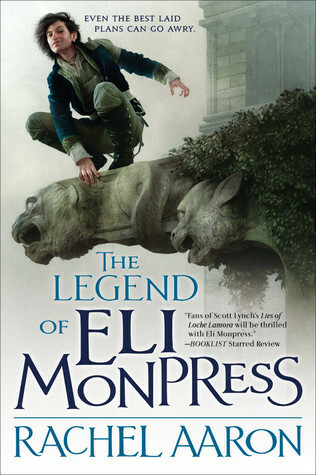 If you are a fantasy-lover and have not yet had the pleasure to read The Legend of Eli Monpress, you are missing out. This series has some of the best world-building of any series I’ve ever read. 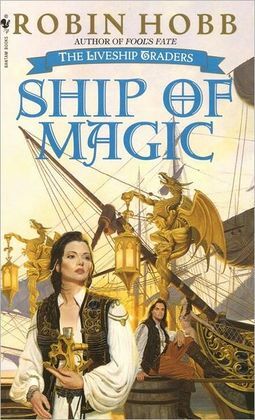 Combine that with great characters, a cool magic system, originality, an engaging plot, and a fantastic writing style, and you can begin to see why I hold this author and series in such high regard. Aaron is such a great writer that, in my opinion, there’s not a single element storytelling from a craft standpoint that she doesn’t do brilliantly. With that said, you would think composing this review would be a walk in the park, however, I’ve stalled on writing it longer than any other book this year. I loved how it wrapped up all of the conflicts of the series. It was a beautifully epic series that deserved an epic ending, and that’s exactly what it got. I feel really guilty for saying this, but I think the ending may have been just a tad bit too drawn out. It essentially took up a full third of the book, making me hold my breath uncomfortably for a really long time. There was so much momentum going into this last book that I don’t know how Aaron could have done it any other way. I wanted to know what happened badly enough to devour it in one sitting, but definitely had one of those Lord of the Rings (film) moments where I wasn’t sure if it was actually ever going to end. As with the LOTR, although it felt drawn out, I couldn’t tell you which part I felt she should cut… it was all essential to completing the plot and everything needed time to fully flesh out (not to mention the dozen or so amazing characters that needed proper resolution). Anyway, I think you can see why I’ve had such conflict over this one. Let’s suffice to say, now that I’m finished with the series, I eventually loved where it ended. We ‘ll leave it at that. I’m actually kind of sad it’s over – I thoroughly enjoyed these characters, some of which are now among my all-time favorites (Nico, I’m talking to you). This is one of those books I will definitely go back and reread, if for nothing else than to study the craft because, seriously, Aaron is brilliant. The good news is, I just found out she published a space opera trilogy under the name Rachel Bach, so you’d better believe I will be devouring those as soon as I can get my hands on them! The Overview: Eli Monpress is vain. He’s cocky. And he’s a thief. I don’t know about you, but that short teaser convinced me right away that I wanted to give the series a try – and it was even better than I could have imagined. The first three books have to be, by far, one of the most memorable trilogies I’ve ever read. There was a high level of originality and it was spectacularly funny without ever crossing over to stupid or overdone. I have to give major kudos to Aaron for pulling off two things you rarely see done well in fantasy: creating a feel of wonder, and doing so using almost poetic imagery. A lot of authors try to introduce wonder into their stories but it usually comes off ridiculous rather than awe-inspiring. Aaron pulls it off in a cheeky, fun manner without losing any more serious and thought-provoking overtones. She did this through exceptional character development and dialogue and introducing epic world-building and magic systems. I can’t say enough good things about this series. I am hooked, and will definitely read anything Aaron publishes in the future. 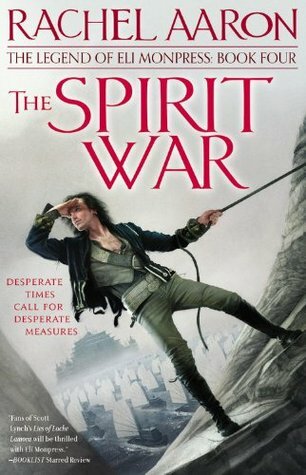 Surprisingly, compared to the first three novels, I thought the Spririt War started out a bit slow. Luckily, it was still rich, quality writing, so the pace didn’t bother me like it might have in other books. Regardless, the slower pace can be attributed to Aaron’s choice to expand on some minor characters and introduce some new ones, which means that she couldn’t possibly take it any faster if she wanted to develop them properly. 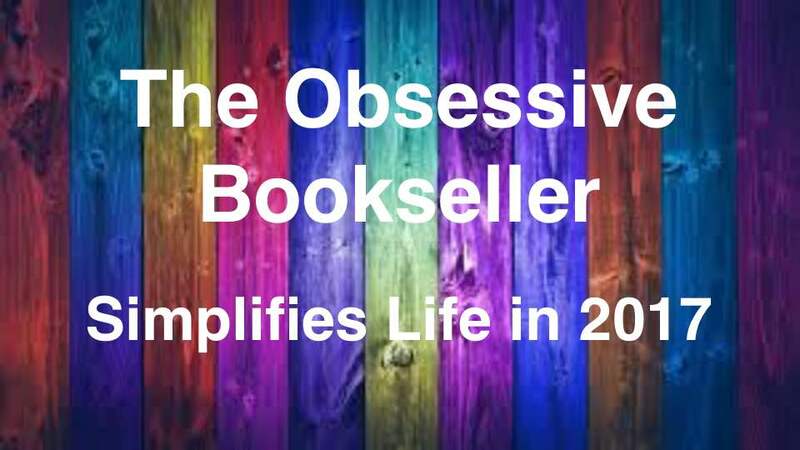 I have criticized authors in the past for telling their stories from multiple viewpoints. I believe the key to doing this well is making sure all of your characters add directly to the overall arc – with each perspectives taking nothing away from the story’s momentum. All of Aaron’s viewpoint characters help maintain this momentum, adding a complexity to the story that still blows my mind. Aspiring writers out there, including myself, could learn a lot by studying the way this author weaves the story, creates and maintains characters, and describes her world. She brings things to life and does so in a beautifully effortless manner. I will definitely be rereading this series for tips because there were moments of pure brilliance in every aspect of her writing. Recommendations: As I said before, this series is whimsical without being ridiculous. I find myself recommending it to many types of readers because it’s one of those stories that has appeal for all ages (but for the sake of a few “scary” moments, I keep the recommends to 10+). It is probably best for fantasy lovers who are in the mood for something different. Its also my number one choice when someone says they want something “fun” to read. 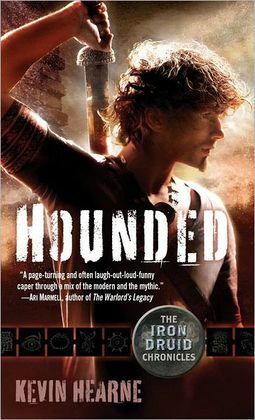 One of my favorite reads of 2011, the “Legend of Eli Monpress” trilogy was extremely entertaining. 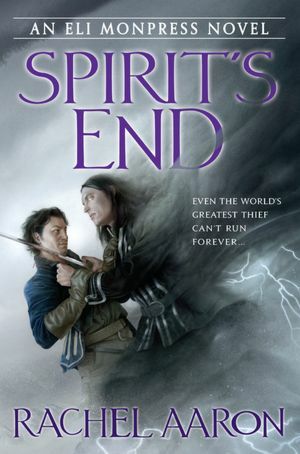 I am completely invested in all of the characters, and can’t wait to get my hands on “Spirit’s End” to find out what happens to them next! If you sick of the same old stuff, this is the series for you! !